Seems like it’s not just raining Bollywood and celebrity weddings, it’s raining weddings in the Ambani household too! While I'm still recovering from the grand pre-engagement and even grander engagement of Akash Ambani and Shloka Mehta, while not to forget the Isha Ambani and Anand Piramal’s engagement bash a couple of months back, the news of a 3rd Ambani engagement is here already! 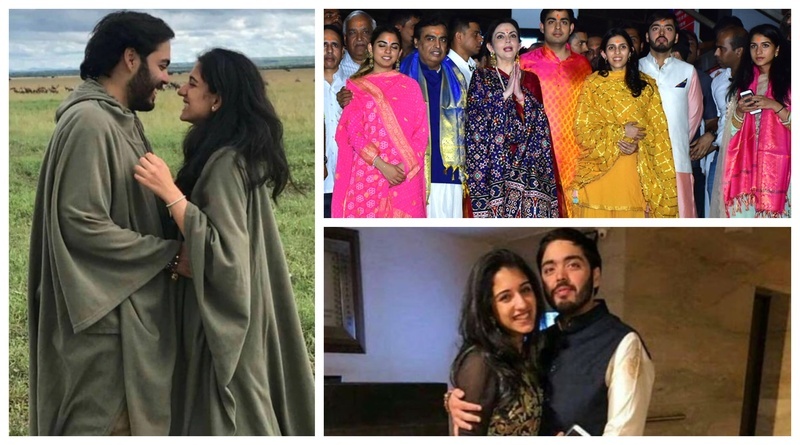 The youngest son of Mukesh & Nita Ambani, Anant Ambani is now rumored to be engaged to his lady love Radhika Merchant, and the netizens seem to have lost their cool over this one! Spotted in this picture are Anant and Radhika wearing matching green robes, smiling at each other ...and lost in each others eyes amidst the green pastures behind! If that’s not love, I dunno what is. At Akash and Shloka’s engagement Shah Rukh teased Anant Ambani about his rumoured girlfriend Radhika Merchant and it’s so cute. In a video that’s been doing the rounds on social media, King Khan is seen asking Anant to rate Radhika on her performance. Anant ecstatically replied, "10 million...infinity!". Shah Rukh continued pulling Anant's leg and asked, "Tumhari koi girlfriend nahi hai? (Don't you have a girlfriend? )", with Radhika standing right next him. And this goes without saying, Anant’s reaction is 10 Million….infinity too! For those who don’t know, 23-year-old Anant has studied at the prestigious Brown University in the US and you must have seen him with his mother, Nita Ambani at various IPL matches, cheering for Mumbai Indians. Radhika Merchant on the other hand is a 24-year-old graduate in Political Science from the New York University. She did her schooling from Mumbai’s Cathedral and John Connon School and École Mondiale World School before completing her IB Diploma from BD Somani International School. And that just in, mommy dearest - Nita Ambani was heard saying in an interview, “Mukesh and I have given very strong foundation to our kids and even larger wings to fly - they have the freedom to take decisions for themselves and of course, choose whom they would want to spend the rest of their lives with. Marrying the one you love is gratifying and heart-warming”. Sooo, should I be expecting a 3rd Ambani engagement this year? Okay, toooo much excitement and here’s trying to KEEP CALM and *fingers crossed*!